Zutter, creator of the Bind-It-All, will be releasing these new tools at CHA. 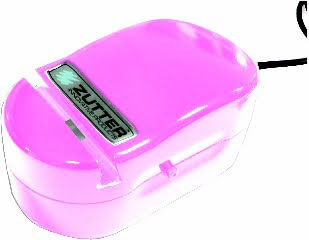 Next up we have the Zutter Kutter. It cuts chipboard, cardboard, foamboard, etc. What do you think? Let us know? 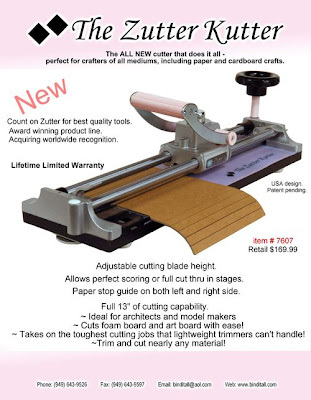 The cutter sounds fabulous and I'm excited about the distressing device but need to see it in action. Oh I have been waiting oh so patiently for something to do my distressing for me!!!! WOOOT!!!! Hmm - I'd want to see more about the distresser, but I WANT the cutter now! Looks like good products but the cutter is too expensive for me. I want, no need reviews on both. I am the type to buy the best tools I can afford and if I can't afford them, I save until I can. The distresser could be crappy and gimicky or awesome! But that cutter looks like a quality, serious tool. I can tell you how often I've wanted to custom cut coasters and this baby looks like she could tackle anything short of planks if wood! Awesome!! I don't think I would use the cutter enough to justify the cost. The distressing tool??? It looks like a cutsie version of a mini hand sander...I think I will pass. too many cutters out there, I will stick with my original. Now as for the distresser, I might do more distressing with something like this. I do use my distressing tools here and there and would use them alot more if it were easier. I would probably add this to my wish list. I would most definitely get alot of use from the distressing tool. Much easier for my carpal tunnel. I would love the Kutter but the price is way too high for me. Not sure how many consumers would purchase a tool with this $ amount unless they offer some kind of introductory promo. HEY--we're in tough times right now--LOWER the price!! pretty cool, but will have to see how much it cost. we do not need anymore expensive gadgets... but i really like the concept. look forward to checking it out and seeing it in actions and mostly the price. Both of these products look interesting---the cutter more so than the distresser. If there's one thing this market doesn't need anymore of is an overly priced gimmick device. If you want to see the distrezzer in action you can go to my blog to view the video. The MSRP for the Distrezzer is $39.99.